Application pool stops randomly within a specified time period. 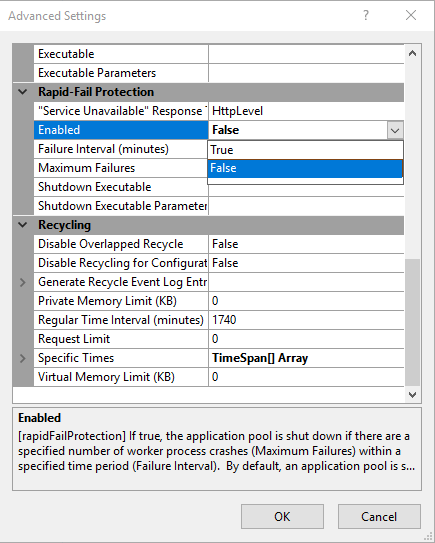 Rapid-Fail Protection disables application pool if it crashes several times within a specified time period. Rapid-Fail Protection prevents the failing application pool from getting into a continuous loop of crashing. This is useful when an application goes out of control which could overload the server. In general, it is better to review the application code to resolve crashes. Open Internet Information Services (IIS) Manager > Application pools > choose application pool > Advanced Settings. Scroll down to Rapid Fail Protection and change the option Enabled from True to False. Click OK to apply the changes. Note: if the application is crashing frequently, it may require reviewing the application code in order to prevent repeated crashes.